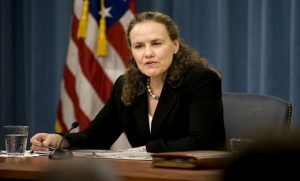 The U.S.’ adversaries in cyberspace would respond to attacks from the U.S. with offensive actions of their own, former Defense Undersecretary Michele Flournoy said Wednesday. AOL Defense reports she also said the country is not prepared to defend against cyber attacks. According to the story by Otto Kreisher, she supported helping partner nations build up their military capabilities to help defend against low-end threats such as improvised explosive devices and suicide attacks. Flournoy also supported the AirSea Battle Doctrine, being developed by the Navy and Air Force, to address threats from Iran and China in the electronic warfare arena. According to the Defense Department, the Navy and Air Force are collaborating to develop joint wargames and facilitate cooperation.